Solar Space Heating Systems are by far the most efficient home heating systems available. Both our Solar Space Heating Systems use a microprocessor based custom controller which also calculates and stores system performance figures. The controller automatically controls a fan/blower by monitoring two accurate temperature sensors to determine if solar heated air is both available and required in which case the fan is turned on, if not the fan is turned off. The system Controller starts and stops transferring free solar heated air based on four numbers a) through d) described below. Attic Solar Space Heating Systems. The transfer of solar heated attic air to your home is controlled by a) the Attic Air Temperature, and b) the Room Air Temperature. Two Attic Solar Heat Harvester Controller user preset parameters, provide user control, c) the 'Maximum Room Temperature' ('Max Rm Temp') and d) the 'Minimum attic – Room Temperature' ('Attic-Rm Temp'). ASSH systems first open the air valve in the duct then after a few seconds turn ON the Blower/Fan when: your Room air Temperature < 'Max Rm Temp' AND your Attic Air Temperature > your Room Air Temperature . + 'Attic-Rm Temp' +1.5°c. AHH systems turn OFF the Blower/Fan and close the air valve to prevent heat escaping to the attic when: your Room Air Temperature > or = 'Max Rm Temp' OR Your Attic Air Temperature < or = your Room Air Temperature + 'Attic – Rm Temp'. Conservatory Heat Harvesting Systems The transfer of solar heated conservatory air to your home is controlled by a) the Conservatory Air Temperature, and b) the Room Air Temperature. Two Attic Heat Harvester Controller user preset parameters provide user control of heat transfer, c) the 'Maximum Room Temperature' ('Max Rm Temp'), and d) the 'Minimum Conservatory – Room Temperature' ('Cnsrv-Rm Temp'). CSSH systems turn ON the Blower/Fan when: your Room Air Temperature < 'Max Rm Temp' AND your Conservatory Air Temperature > your Room Air Temperature . + 'Attic-Rm Temp' +1.5°c. CSSH systems turn OFF the Blower/Fan when: your Room Air Temperature > or = 'Max Rm Temp' OR your Conservatory Air Temperature < or = your Room Air Temperature + 'Cnsrv – Rm Temp'. Important Note - If the thermostat of your home heating system is set to a higher temperature than the AHH Controller Maximum Room temperature the Solar Heat Harvesting system will not operate. To reduce home heating costs even more we recommend that, at warm periods of the year, you turn off your central heating system. The electricity you save by not having your central heating system on standby will more than pay the Solar Heat Harvester running costs so your heat will be better than free! The most efficient home heating system available today? At latitudes above 45 degrees Solar Heat Harvester systems provide secondary heating, i.e. they do not provide all year round heating, their huge advantage however is that the heat they do provide is essentially free compared to heat from all other heating systems. Solar Space Heating System - the most efficient home heating system available? The location of your home has a significant impact on when solar heat harvesting supplies the most heat. 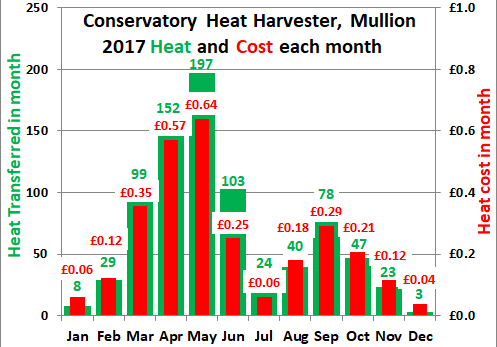 In the north of the UK, most solar heat is transferred to the home during late spring, summer and early autumn months as shown in the first chart above. 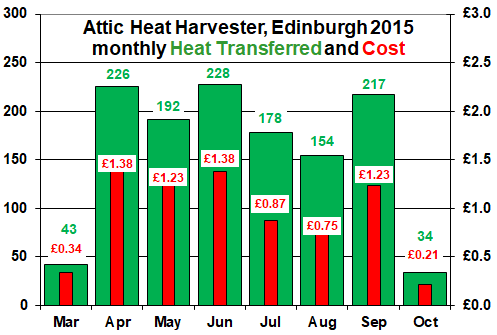 In the south of the UK, most heat is transferred in spring and autumn months as shown in the second chart above. Generally in the UK solar heat harvesting provides very little heat in winter months.